Banks were among the market leaders on Thursday after regulators approved large increases in dividends and stock buy backs. The approvals came after banks passed their annual stress test and demonstrated they had sufficient capital to survive a financial crisis. Stress tests were instituted after the financial crisis. Before the crisis, banks had been increasing their operating leverage. This allowed them to increase earnings which were then used to reward share holders with dividends and buy backs. During the financial crisis, it became obvious this business model carried too much risk. In response, regulators decreased the amount of leverage banks could use and instituted stress tests. These tests assumed the banks would suffer large losses in a financial crisis. Under the new regulatory regime, banks were required to have enough capital to survive a crisis. This required banks to use less leverage in normal times and banks were forced to set aside higher amounts of capital. Based on this year’s tests, analysts believe the banks have enough capital. 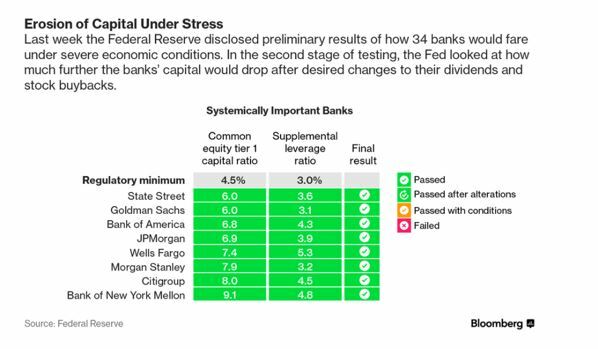 This year, for the first time, all banks passed the stress tests. The chart above shows that all banks now have enough capital to survive an economic downturn. However, it is possible the actual downturn could be more severe than expected and there is no guarantee the banks will survive. But, there is a general agreement that banks are stronger than they were in 2008 when the previous crisis unfolded. To prevent another crisis, regulators also required banks to obtain approval for dividends and share buy backs. This has kept payouts low as regulators prioritized building capital over rewarding share holders. This year, banks are being allowed to increase dividends. In addition to boosting their dividends, banks will also be buying significant amounts of their outstanding stock. JPMorgan plans to increase share repurchases to up to $19.4 billion over the next 12 months. This is a 90% increase compared to a year ago. Citigroup plans to repurchase up to $15.6 billion worth of stock. Bank of America announced plans to buy back up to $12 billion. 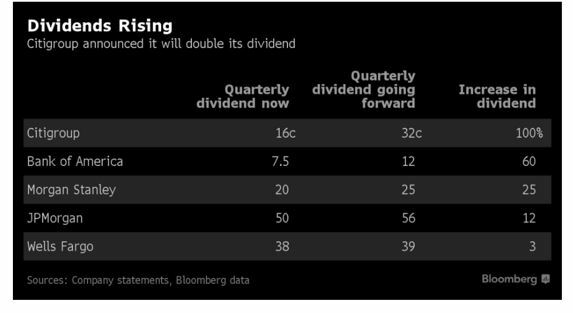 Banks, as a group, are now expected to pay out close to 100% of their earnings in buy backs and dividends. All of the country’s large banks passed the stress test and all boosted their share holder payouts. From a fundamental perspective, all of the banks look strong. The same is true from a technical perspective. Many of the charts show similar and bullish patterns. When an entire sector looks healthy, it can be useful to look for an exchange traded fund (ETF) that tracks the sector. A sector ETF allows a trader to obtain exposure to all of the stocks that the ETF holds. The rewards are likely to be lower than the best performing stock in the sector. But, the rewards will also be better than the worst performing stock in the sector. The ETF eliminates the need to pick the best stock. That is one advantage of trading the ETF instead of individual stocks. But, the disadvantage is the returns of the ETF will mirror the average returns of the sector. This is because the ETF is diversified and has lower risk. When selecting an individual stock, there is always a risk that there will be bad news about that company. Because the risks of loss are greater with an individual stock than with an ETF, the potential rewards of an individual stocks are greater than the potential gains of an ETF. But, managing risk is important for traders. This is especially true for small traders who cannot risk large amounts of money on individual trades. ETFs are a cost effective tool that can help them manage risk. For banks, there are several ETFs available. One of the broadest and most liquid is the Financial Select Sector SPDR Fund (NYSE: ETF). The chart below shows the price action in XLF. This is a daily chart and a recent pattern is highlighted by a blue rectangle in the chart. The chart shows XLF rallied for a few weeks after the election. That rally stalled in December and the ETF has been in a broad trading range since then. The blue rectangle on the left side of the chart highlights the most recent portion of that consolidation. This pattern could be considered to be a rectangle. Other technical analysts might call it a complex inverted head and shoulders or possibly a wide cup with handle pattern. There are a number of possible names for the pattern but the name is less important than what the pattern means. No matter what a pattern is called, the implications of the pattern are the same. Technical analysts expect a degree of symmetry to be associated with any pattern. This symmetry allows them to project the price targets. In a pattern, the depth of the pattern indicates the size of the potential move after the pattern is concluded. In this chart, the depth of the pattern is equal to the distance between the high and low highlighted by the rectangle. The price target is projected on the chart based on that distance. With a bullish outlook, a number of trading strategies are possible. Traders could buy the ETF or they could use an options strategy. Buying a call option allows traders to participate in the potential upside of XLF. So does selling a put option. Selling puts is a bullish strategy since the goal is to generate income from the sale of the option and book a profit when the put option expires worthless. This will happen if the price of the stock or the ETF is above the exercise price of the option. One problem with selling puts for small traders is that the strategy can require a significant amount of margin, usually about 20% of the option exercise price times 100. Another possible problem is that strategy carries a relatively high amount of risk in dollar terms. Both of these problems can be addressed by using a spread. In this case, the trader would sell a put option and then buy a put option with the same expiration date but a lower exercise price. This strategy caps the risk of the trade. For XLF, options expiring on July 21 could be used to create the spread. A trader could sell the July 21 $24.50 put for $0.36 and buy the July 21 $23 put for $0.06. This generates immediate income of $30 since each contract covers 100 shares. Risk is limited to the difference between the exercise prices less the premium received when the trade was opened. The difference between the option exercise prices is $150 and that amount is reduced by the $30 in premiums received. This amounts to a total risk of $120 for this trade. Many brokers will require a margin deposit equal to the amount of risk on the trade. Others may require a higher deposit equal to the difference in the exercise prices. Either method requires only a small amount of capital on hand to implement this trade. The potential return on risk is equal to 25%, $30 in potential gains for $120 in total risk. This is for a trade lasting less than one month. Spreads can be useful because they offer high potential returns on investment and last a short amount of time. They could be a valuable tool for small traders looking to compound wealth quickly.